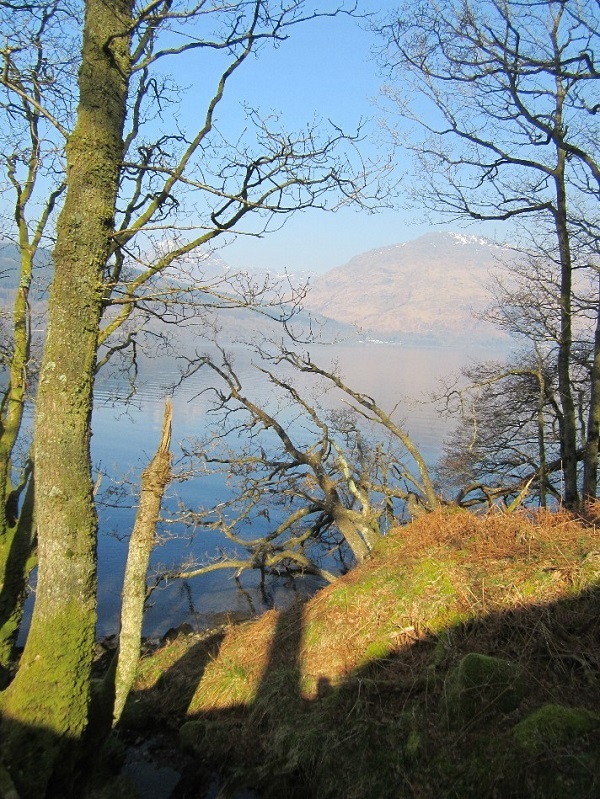 Several years ago Nita and I spent a long day walking right around Ben Lomond, rather than climbing right to the top. It made a fascinating walk as once we’d left the main paths and descended around the “back” of this hugely popular hill, we saw no-one. What we did see though, was the very rugged nature of this side of the hill and it was a really worth while trip. On that day, our route bought us back to the main Ptarmigan path via the broad grassy ridge leading north across a high col to a small rounded top called Cruinn a’ Bheinn. At the time I remember thinking that it would make a fine view point but we never got around to going over there. As you know, Nita and I are trying to regain our hill fitness after our long lay-off and we decided to tackle some of the smaller hills to start with. A couple of weeks ago we had two fine days over on the Luss Hills and having both survived and enjoyed these two trips, I got out my copy of Andrew Dempster’s “The Grahams” and had a look to see if there were any Grahams we’d over looked in the Loch Lomond area. To my surprise I found Cruinn a’ Bheinn which I’d completely forgotten about since our trip around Ben Lomond and which I’d never even suspected was a Graham! So then, with a gap in what has been a very busy work schedule of late, we headed for this “wee” hill yesterday. 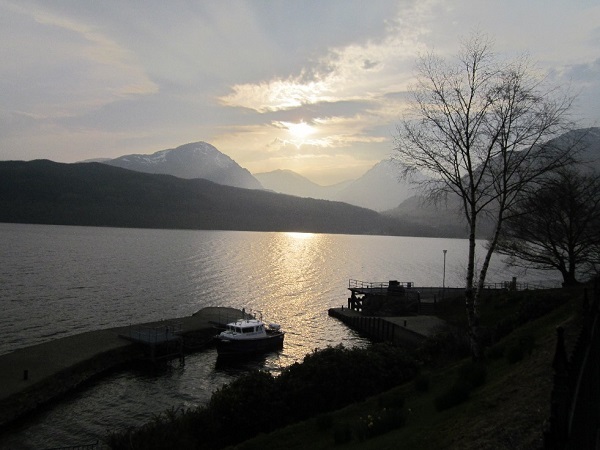 The book reckoned the shortest way to its summit was from Inversnaid on the east shores of Loch Lomond. This requires a lengthy drive to get to it but in almost perfect spring conditions we drove the final 15 miles from Aberfoyle to Inversnaid gawping at the beautiful views over the lochs, woods and hills ….sometimes bright under the clear blue skies and at other times shrouded in banks of mist. Wow, it was quite a stunning drive. To get to Cruinn a’ Bheinn, involves a two and a half kilometre walk south along the WHW before picking up a big estate track that climbs very steeply up the hillside above the loch and crosses a broad and wild col. With the narrow WHW path needing a lot of concentration to negotiate with my fuzzy eye it took quite a long time for us to reach the track heading up Then, as I say ….it was up hill…..very up hill. The views were very fine though so our numerous stops were well rewarded. 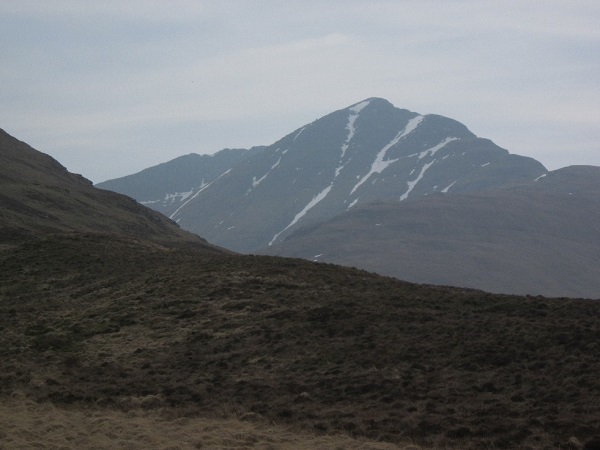 Eventually as we neared the top of the steep and the track started to make its way across the col, we got our first view of Cruinn a’ Bheinn ….and more is the point, of Ben Lomond. Quite impressive with all the gullies filled with snow. From this point, it’s a case of leaving the well made track and heading directly towards the hill over very boggy and rough ground. It was surprisingly hard work but not as hard as the 300m pull up to the summit of Cruinn a’ Bheinn …which was very steep in places. We finally reached the small summit cairn four hours and fifty minutes after setting out, but it was well worth while as the views to Ben Lomond were fantastic. Even from two kilometres away, Nita could see lots of folk at its summit…..and yet we had our little hill to ourselves. We got back to the car a little over nine hours after setting out, which was somewhat longer than the 3-4 hours mentioned in the guide book! Oh well, I feel somewhat better about this after just reading a report on-line, written by a chap who climbed this hill with some friends…. and wrote that he reckoned Mr Dempster must be rocket powered as it took them 7 hours to do the walk. So then, nine hours for a chap who is registered as blind ….can’t be too bad ….especially as I had to stop to try and record the sound of a Golden Eagle calling high above us. That’s my excuse anyway! Thoroughly recommended ………. how ever long it takes you. Walking isn’t always what hill walking is about!